VertaseFLI was commissioned by English Cities Fund to undertake stabilisation works on 14,000m3 of dredging materials from Millbay Docks. 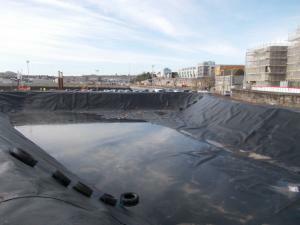 The dredgings had been temporarily stored in lined capped lagoons on the quayside and the stabilised material was used to create a development platform for the subsequent mixed use development. 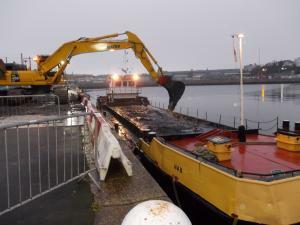 VertaseFLI also managed the unloading and transport of new dredging material from the docks, this included 24hr hour unloading of barges and the construction of a new lined and bunded containment lagoon.. Prior to the site works, VertaseFLI completed a bench scale treatability trial to determine the appropriate reagent mix to achieve the geotechnical and chemical requirement for the site. All site works were undertaken under VertaseFLIs Environmental Permit and under a Materials Management Plan to allow the re-use of the materials. The three bunded lagoons containing dredgings were carefully excavated. The shillite (interbedded shale and sandstone) which formed the capping and bunds of the lagoons was carefully removed and stockpiled separately to be used as a capping material following completion of the stabilisation works. Hardstanding encountered beneath the lagoons was broken out and crushed for future re-use. Excavated dredgings were placed in layers and the appropriate proportion of reagent mix added. The material was then rotivated to mix the reagent evenly, once mixed the layer was rolled. Validation samples were collected from every layer to confirm that they met the required chemical and geotechnical specification. Layers were built up following this methodology until restoration levels were reached. A capping layer was then placed across the finished surface. Concurrent with the works, VertaseFLI unloaded new dredged material from barges on an 8hr cycle to coincide with tide times. These new dredgings were transported to a newly constructed lagoon. To prepare the dredgings for stabilisation and re-use in a later development phase, the lagoon was designed to collect water from the dredgings, the water was treated via an onsite water treatment plant prior to discharge.